Installing HappyFox Chat For WooCommerce plugin is alone sufficient for showing chat widget in your website and also for fetching order and cart details. 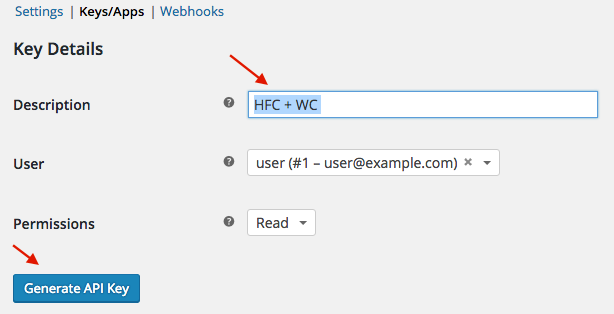 If you have installed HappyFox Chat For WordPress plugin, kindly deactivate and delete the WordPress plugin and then install the WooCommerce plugin. View the Order Details of the customer. View the Live Cart Information of the visitor. View the Guest Order Details of the customer. Only Admin of HappyFox Chat has the access to perform the integration. You need to have WooCommerce plugin installed in your WordPress site (a self-hosted or VIP WordPress site). 1. Go to WordPress Admin panel and Click on the WooCommerce tab on the left pane → Select Settings. 2. Now Click API tab → Go to Keys/Apps and Click Add Key. 3. Enter Description → click Generate API Key. 4. Now copy the Consumer Key and Consumer Secret. Step 2: Go to Apps → E-Commerce → WooCommerce. 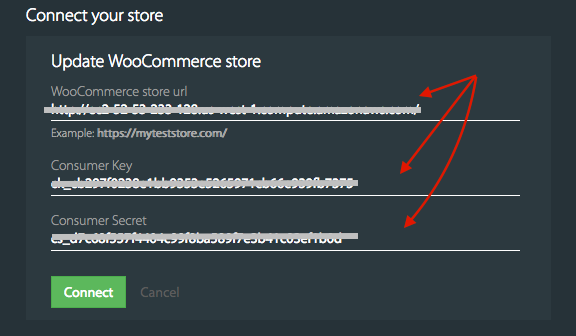 Step 4: Enter your WooCommerce store URL, paste the Consumer Key and Consumer Secret → click Connect button. Step 5: After clicking connect, WooCommerce API key will be generated → Copy the API key. Step 6: Update preferences to the Settings section → Click Update Settings. i) Login to your WordPress account → Go to the admin panel. ii) Click Plugins → go to Add New → Type HappyFox Chat on the search bar. 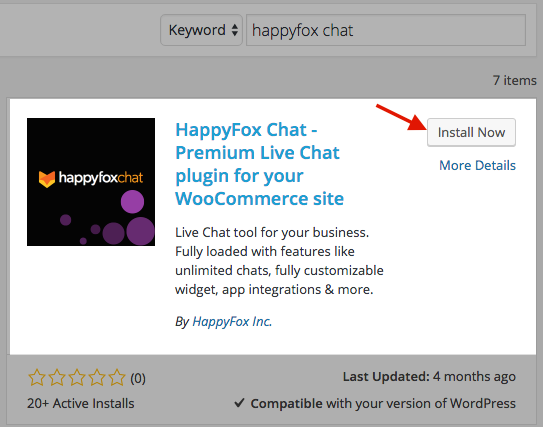 iii) Click Install now on HappyFox Chat - Premium Chat plugin for WooCommerce site. iv) Click Activate plugin hyperlink on the resultant page. v) Click HappyFox Chat tab on the left → Paste the WooCommerce API Key copied from HappyFox Chat → Click Save / Change API key button. Once you connect the account successfully, you are all set to chat! HappyFox Chat widget will be installed on your WooCommerce site. View the Order Details and Live cart details of the customer during an ongoing chat on HappyFox Chat.